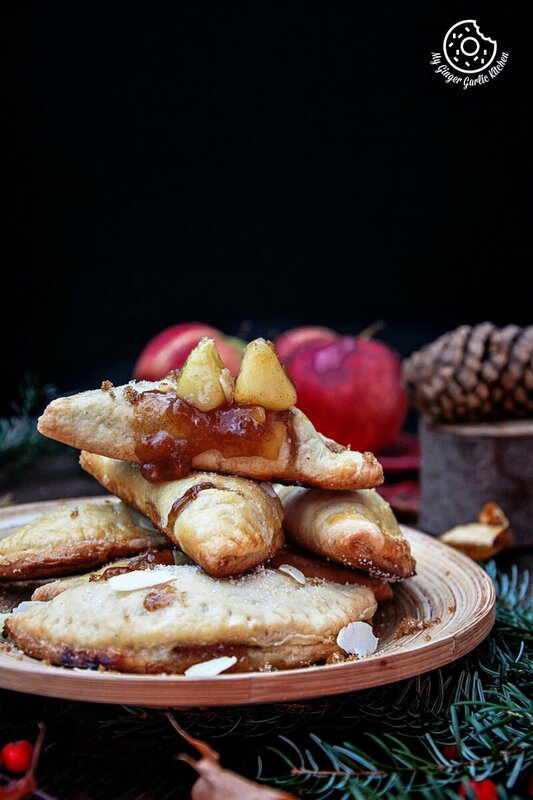 Apple Hand Pies. 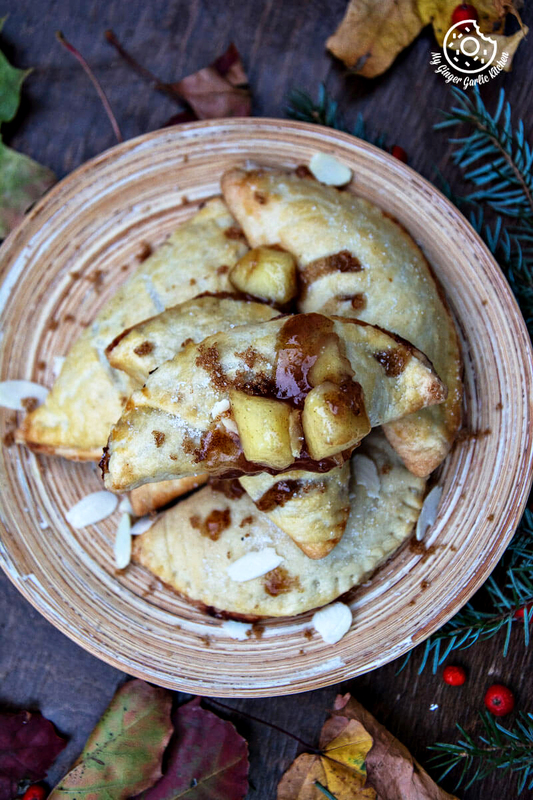 These apple hand pies are pretty easy and simple to make. Plus they taste awesome. Eating them is a sensual experience in itself because they are buttery, flaky, crisp on the outside and luscious and sweet inside. Waaait! Whaaat! Is it Monday already? I mean are you also facing Monday blues or a feeling like it’s a gloomy Monday? Well, I am not sure about you guys but it’s really dark and not really cheerful weather here. Although the Autumn leaves are doing their best to cheer up people. But we still need some more cheering. Well, this is to compensate for the dark weather outside. I just need something which could make me feel good. Now when we talk about Autumn and cold and feeling good, then there are only a few things which would foot the bill. 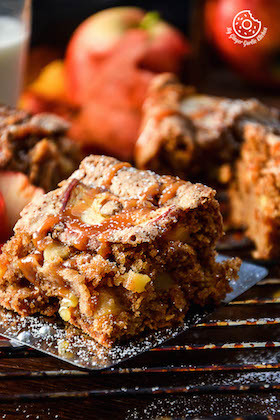 Autumn food: Autumn reminds me of apples, pumpkins, squashes, or may be some baked goods. So are you ready for something easy peasy and delicious? 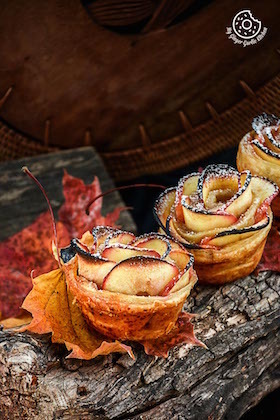 Somethings which have apples and are baked too. For me this time certainly calls for a warm hand pie. Beginning of the week and hand pies go so well together. Who wants to work harder on the very first day after the weekend. Isn’t it? So yes. I am more than ready for a hand pie. Are you ready too? 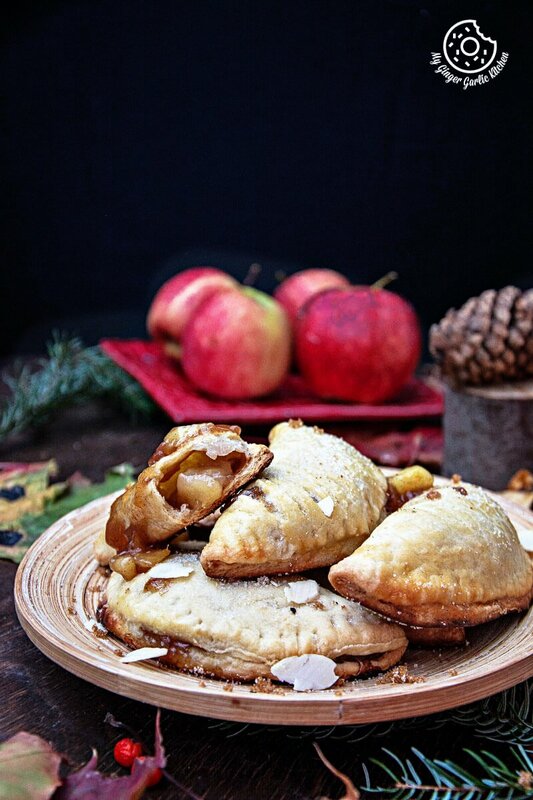 If yes, then let’s talk more about these apple hand pies. 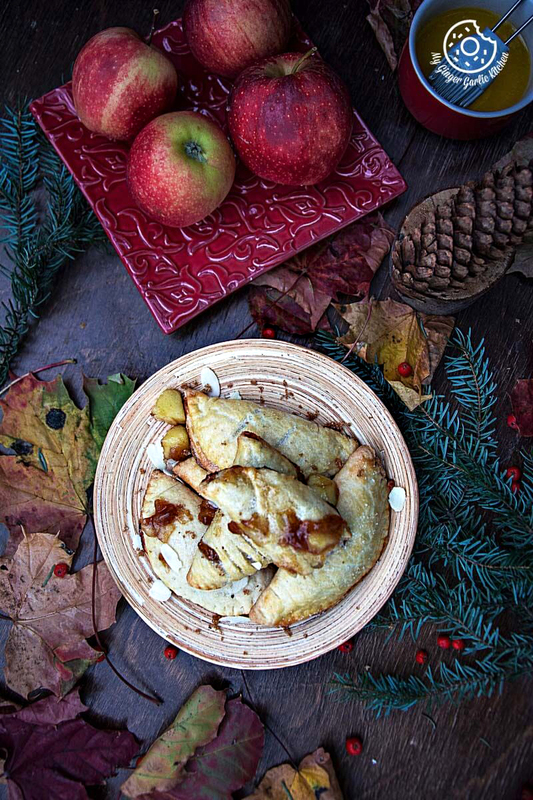 Let me present you my first apple recipe of this season. 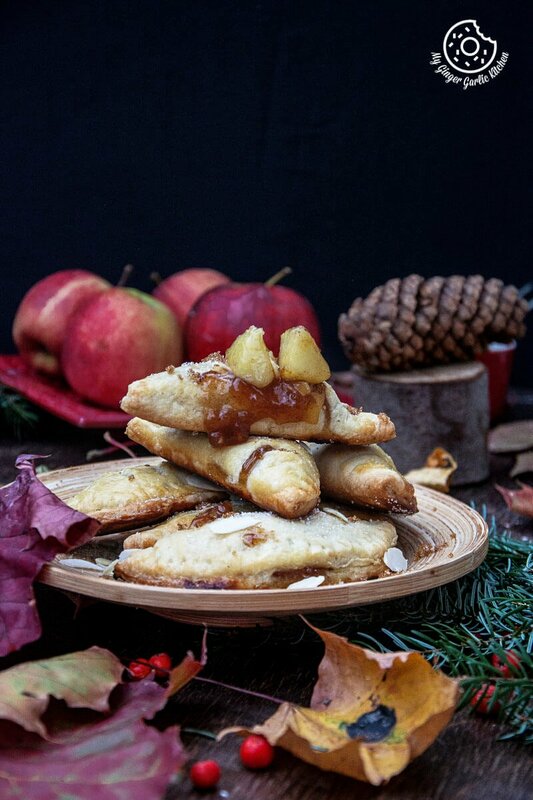 Finally, this time I shared my first apple recipe of this Autumn. I know it took me so long. Believe it or not, I have had these apple hand pies in my drafts folder for a long time. In fact I was thinking about posting them in September, but I just don’t know why I didn’t share them and waited till today. And you know what — I have been thinking deeply about sharing these since last Monday. That’s why I have a lot to talk about these. But don’t worry, I won’t take too long because my thoughts can wait but these hand pies can not. 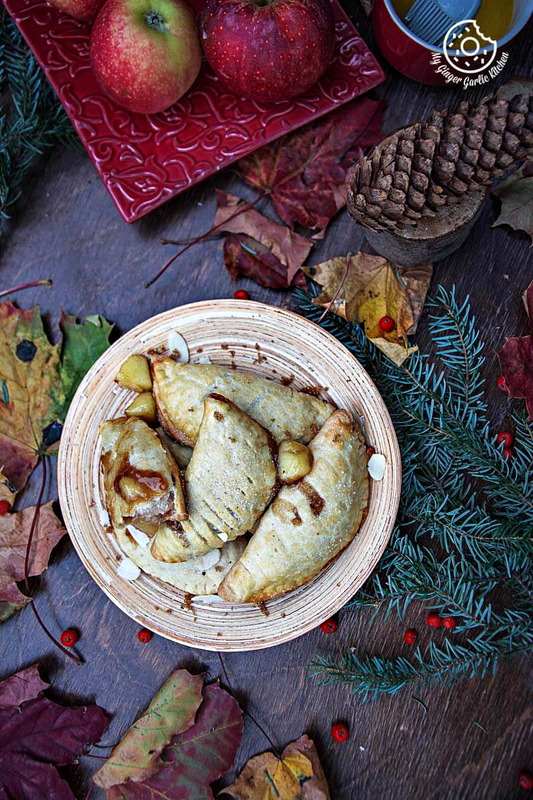 Do you want to know how awesome these hand pies actually are? My love — puff pastry. 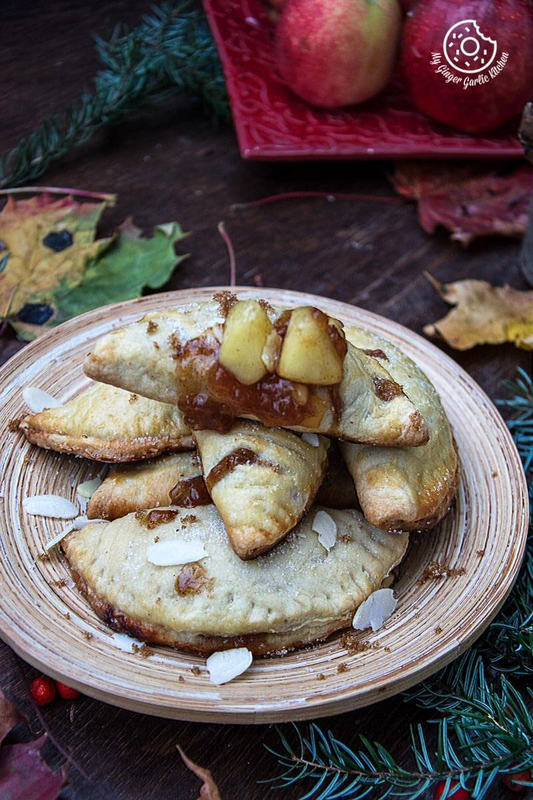 These hand pies are filled with apple pie filling. And that filling takes these pies to a whole new level. I don’t know if you guys know this or not, but I love using puff pastry dough in my recipes. This is kinda magical rescue thing to me, because it can make everything shine. So for me, whenever I am in doubt, I opt for puff pastry. 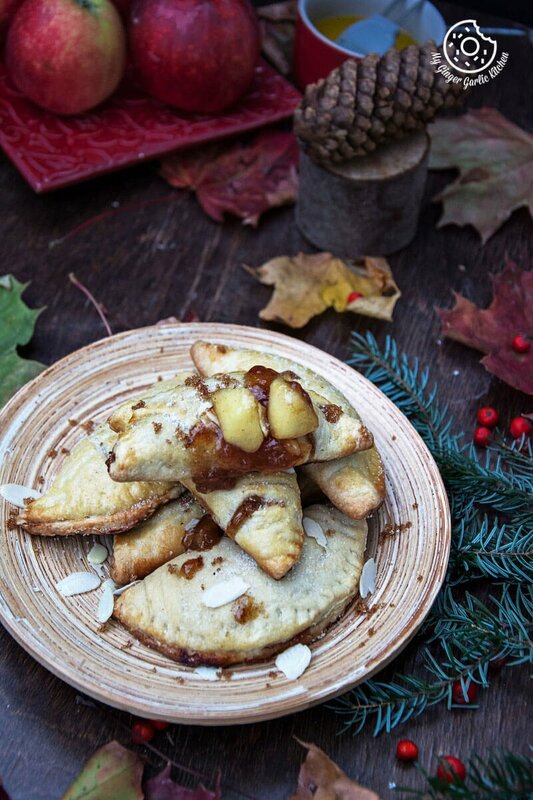 Making these little pies is easy and they are just great for snacking or as an evening dessert. I personally love to have them for my brunch along with a steaming cup of coffee. #Purebliss. They have just the right amount of everything. This time after baking, I also brushed them with some butter and sprinkled some sugar on top. Believe me, it wasn’t overly sweet. They have just the right amount of sweetness we should have in a hand pie. You can use your regular pie dough, but I preferred puff pastry dough as it takes less time in baking and tastes delicious too. They are filled with apple pie filling. These pies are best served when warm and straight out of the oven. Once the hand pies are baked and come out of the oven, brush them with a little butter and a generous sprinkle of powdered sugar. Then some almonds and a spoonful of pie filling on top. Trust me, you won’t regret adding pie filling on top. It just tastes all so divine. 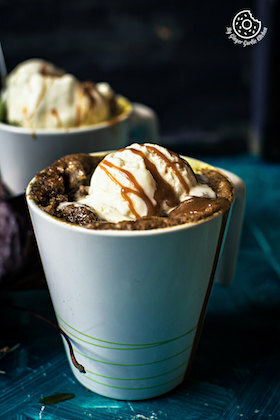 Feel free to serve it along with a scoop of ice-cream. No matter how you eat them, they are just YUM. 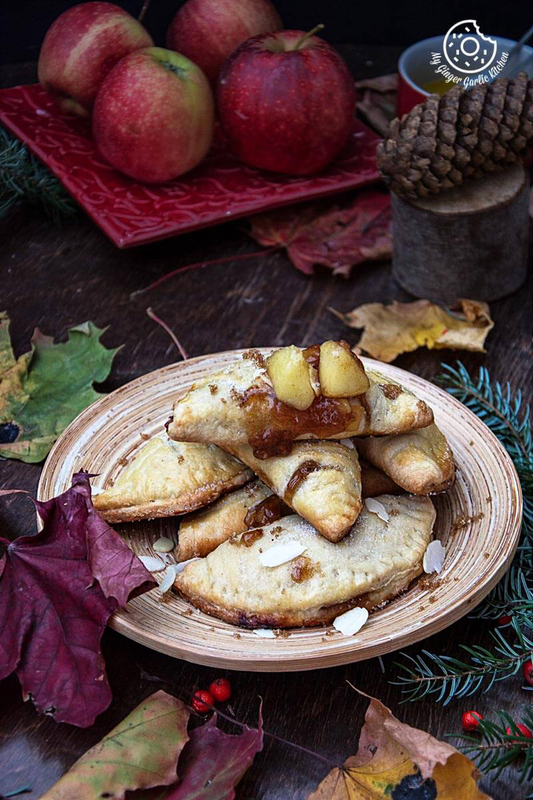 These apple hand pies are pretty easy and simple to make. Plus they taste awesome. Eating them is a sensual experience in itself because they are buttery, flaky, crisp on the outside and luscious and sweet inside. 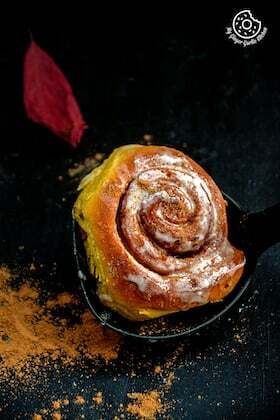 Combine sugars, cornstarch, cinnamon and salt in a bowl. Add apples and boil for a minute. Add cornstarch mixture and to water, stir well, and bring to a boil. Reduce heat to low, cover and cook until apples are tender, it would take about 6-8 minutes. Roll the dough until it is about 1/8-inch thick on a floured work surface. Use a 5 inch round cookie cutter to cut the dough into circles. Roll again the dough if needed. We need about 8-10 circles. Add one heaping tbsp of apple pie filling (without liquid) to the center of each dough circle. Fold the dough in half and use a fork to seal the edges. Place hand pies on lined baking tray. Use the tip of a sharp knife to cut few diagonal slits into the tops of each pie. Use a pastry brush to lightly brush the tops of the hand pies with the melted butter. Bake the pastry pies for 25-30 minutes, or until the tops are lightly golden brown. Brush with more butter and sprinkle with sugar and almonds. Enjoy.